A few days in New Orleans finished off my trip in Louisiana. 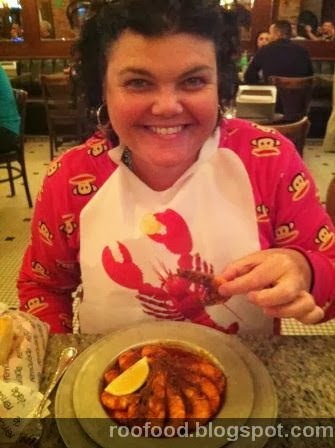 I haven't visited the Big Easy before and was eager to get my teeth into it (no pun intended). . It wasn't very busy down on the street, being a Wednesday night, cold and wet, kept the hoards away perhaps? We headed to Acme Oyster Bar, but the line was out the door and down the street....so we decided to give Felix's Restaurant and Oyster Bar a go. I'm so glad we did! Snuggled down the back in the crowded room we warmed our bodies with a Cajun Bloody Mary. One of the best bloody mary's I've had the pleasure to slurp on! 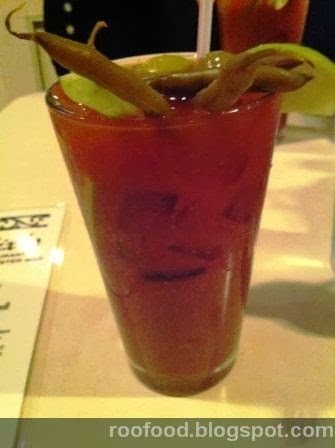 A tall glass of spicy tomato juice with pickled green beans and lime wedges. There is always a dilemma with a new menu. 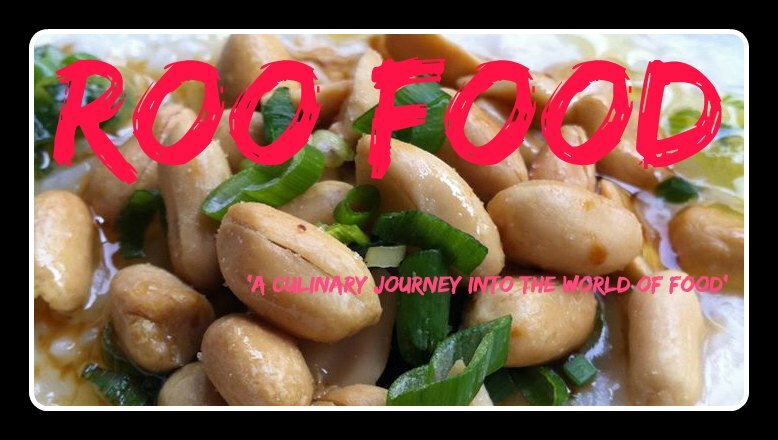 So many good creole eats! 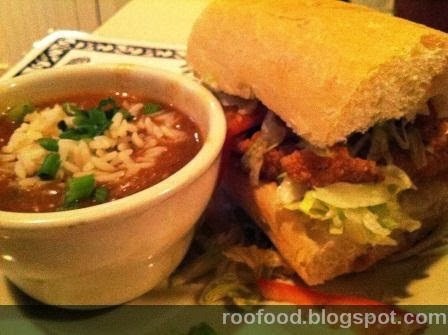 To maximise taste bud pleasure I went wit the 1/2 po boy and a side - This in itself was a dilemma to choice your po boy filling (crawfish, shrimp, catfish or oyster) and the side (jambalaya, gumbo, etouffee or red beans) I opt for the gumbo and the catfish po boy. A good size bowl of gumbo which is thick and tasty and a half slab of bread roll packed with fried catfish and salad. Good wholesome comfort food. Seeing that is is an oyster bar, I couldn't pass up a 1/2 dozen oysters, chargrilled with garlic and parmesan. I've only just started to eat oysters again in the past few years (after many years of not eating due to a bad experience after eating a bad one). These were delicious!! 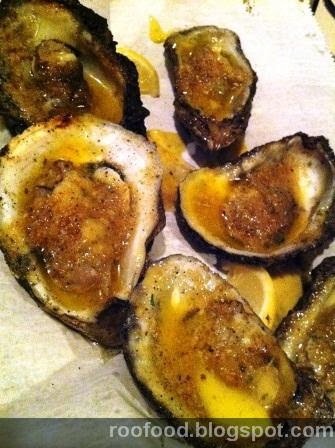 chargrill bivalves = the bomb! 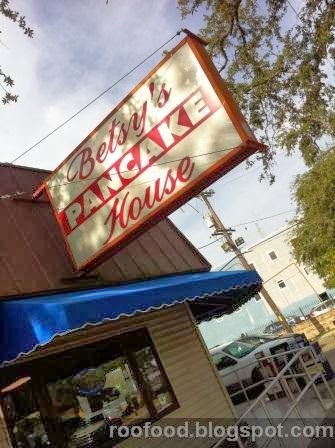 On the recommendation of our waitress from Felix's the night before we rode the street car up to Betsy's Pancake House for a 'local instituation' breakfast. This is a typical neighbourhood pancake house. I love homely, comforting restaurants like this. 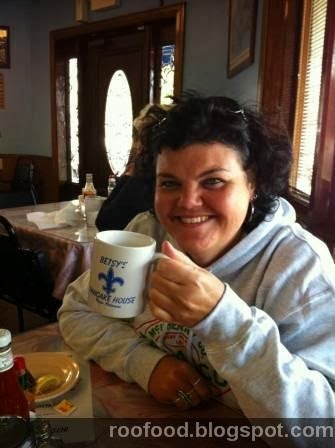 Where everyone knows everybody, the waitress's have all been with the restaurant for many years and call you honey and darling. 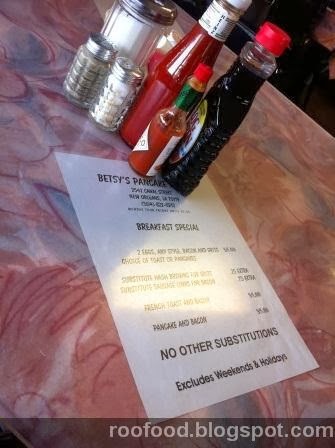 The menu is traditional and extensive but it's the breakfast special (mon-fri) that catches our eye. 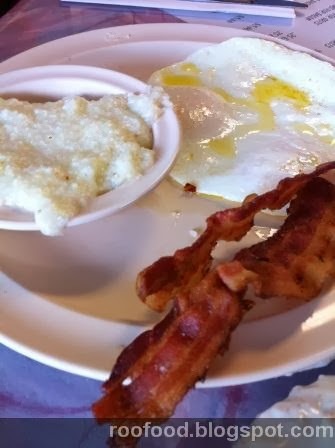 Two eggs, bacon, grits and a choice of toast or pancakes with butter and syrup for $5. 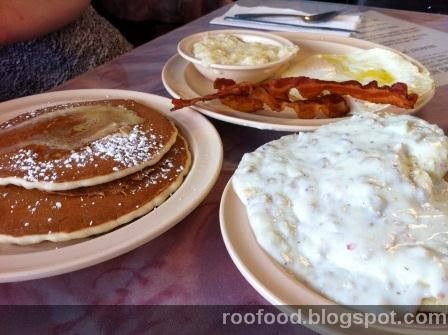 You can't go wrong with a special like this for a breakfast of champions! 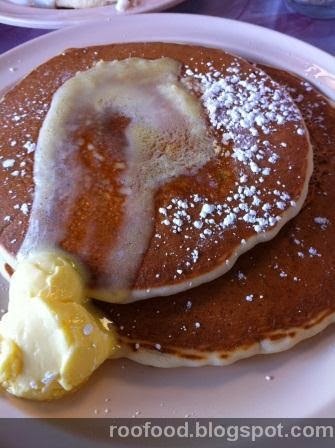 We opt for pancakes. 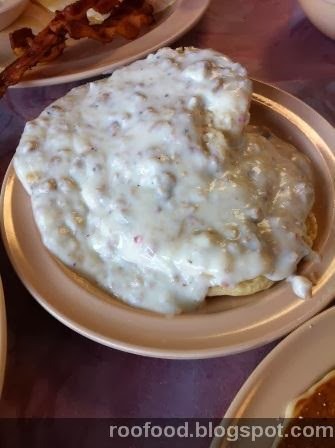 We also add on a biscuit and gravy as a side and we only order for one and share. Even though it's a breakfast for one (and with the added biscuit) between the two of us we still couldn't polish it off! Finally a decent cup of tea in a big mug! 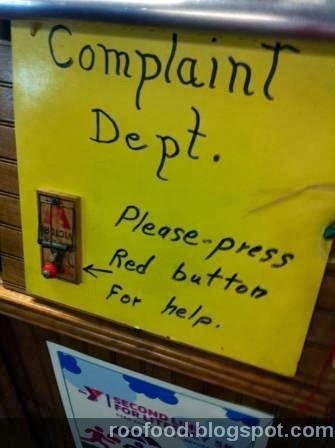 If you do have a complaint you can call for help....I dare you! Remoulade (the casual side of Arnaud's) is a branch off from famous Arnauds restaurant. 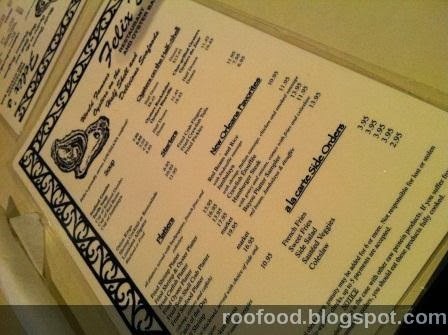 It's a casual cafe style place offering some signature dishes from Arnauds, along with an array of local fare. 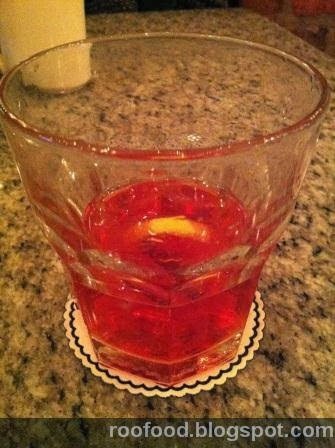 There are a few cocktails that have been invented in NOLA, one of them being a Sazerac - which is sometimes referred to as the original cocktail (however that is debatable). A blend of rye whiskey, Herbsaint (which replaces Absinthe) and Peychaud's Bitters and some sugar. I wasn't sure what to expect, but this shot in a whiskey glass wasn't anywhere near it. 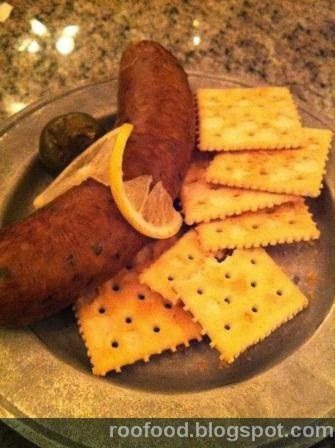 We start with an entree of smoked boudin, the famous cajun susage made with pork, rice, vegetables, herbs & spices, which is smoked and served with crackers and a slice of lemon (for decoration?). It's meaty and spicy and hints of smokiness which is another great preparation method to eat it. This would be my second preferred way (after fried boudin balls). 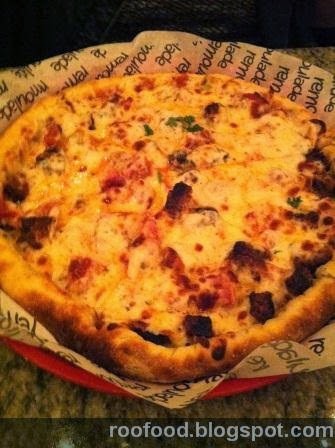 My friend Lynda opted for the Creole Sausage pizza - grilled andouille and hot sausage, mozzarella & creole sauce. She said it was a great pizza. I on the other hand opted for a true creole dish, BBQ Shrimp, which ironically doesn't come near a BBQ. It's sauteed in a big fry pan with lots of butter and pepper. BBQ shrimp - spicy heaven on a plate! With bib on and fingers cleaned I dig into the buttery goodness. 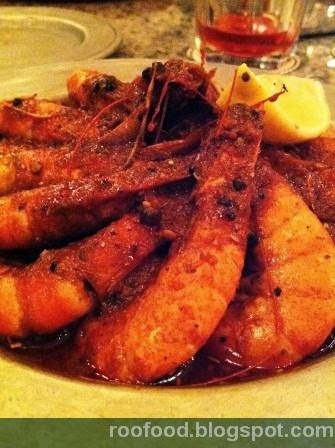 Spiced heavily with pepper, the juicy plump prawns (sorry shrimp) are soon dripping down my hands and my chin. This is one hell of a dish and I'm in love. Sopping up the last bit of buttery sauce with some bread at the end. 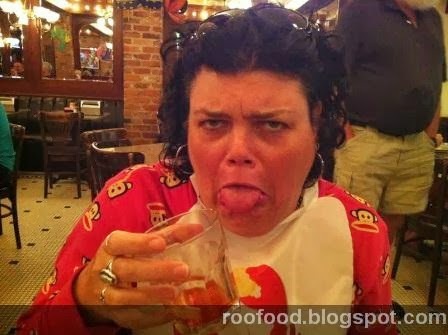 and my thoughts on that sazerac..........enough said!!! Say no to the Sazerac! Ha Felix was so entertaining especially if you sit at the counter in front of the oyster shuckers!